Illustration (just for fun!) by Cathey Graham Nickell … with a little bit of tracing involved. It’s that time of year! Time for Susanna Leonard Hill’s 6th Annual Holiday Contest. The rules this year are fun: Write a children’s holiday story using the basic format/concept of “The Twelve Days Of Christmas,” not to exceed 300 words. The story can be poetry or prose, silly or serious or sweet, religious or not, based on Christmas, Hanukkah, Kwanzaa or whatever else one might celebrate. Once it’s written, the contestants are asked to post it on their website. In February of this year, my “Valentiny” story (which had a 214-word limit)—called “Kandie’s Kiss”—won second place! I don’t know if I’ll get to keep my fancy crown or not, but here goes! Happy Holidays! With lots of love to give. We’d have new reason to live! As long as we recall. Perhaps our wish is too tall? Who had no house to rest. Who’d never had a home before. Santa knew what to deliver. Their emotions were quite sappy. “Three boys and one girl! For Santa had a plan. He added six more to the clan! As they studied, ate and played. Each skin a different shade. On days five and six with brandish. On days seven, eight and nine. On days tenth, eleventh and twelfth. What a nice story. Good luck and happy holidays! Thank you, Gregory! I read your entry, too, and it was a lot of fun! Happy Holidays to you, too. This is beautiful! Definitely worthy of the crown! Awww, thanks. You’re so kind so say that! A lot of joy in this story. Very nice. Thank you, David! I felt joyful while writing it! I’m glad the neighbors’ hearts finally thawed. Sweet story! Yes, those judge-y neighbors finally came around! Thank you! Sweet story, Cathy! We need diversity in PBs, and this is wonderful! Thanks, Shelley! We do need more diversity, and this is my first attempt at such! “All you need is love…” Glad Mr. and Mrs. got their wish 🙂 Good luck! There’s always room for one more. What a precious story. Best of luck to you. Aw! What a sweet story, Cathey! 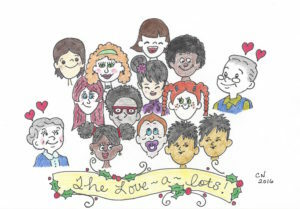 So nice that the Love-a-lots had so much love to give, and that Santa brought them a whole diverse family to share it with! Thanks for this creative twist on the 12 Days, and Happy Holidays! Thank YOU for creating these original, fun contests. I just discovered them this year, and they’re so much fun. Oh my goodness, Cathey…this is wonderful…I love their open hearts and arms for children of all shades…and I’m thrilled the neighbors learned to open their hearts also. A great lesson for the world, in only 300 words. 😉 Well done! Thank you so much, Vivian! A great compliment coming from you. Happy Holidays! Such a love-filled story, Cathey. From the Love-a-Lots filling their home with children needing homes, to Santa making sure they have enough to care for them, to the neighbors who finally showed kindness, too. A great take on the 12 Days! Hi Patricia, I just noticed your comment today. Thank you so much! I didn’t win anything for this submission, but I had fun writing it! All my best to you!